Negative results and findings in science are perhaps less newsworthy, but they are no less important. Particularly when, as in this case, they demonstrate that a possible new therapeutic pathway against idiopathic pulmonary fibrosis and other diseases associated to short telomeres is in fact safe. Researchers from the Spanish National Cancer Research Centre (CNIO) have shown in a new study that the gene therapy with telomerase that they have developed, and which has proven to be effective in mice against diseases caused by excessive telomere shortening and ageing, does not cause cancer or increase the risk of developing it, even in a cancer-prone setting. This paper has been published in the journal PLoS Genetics with the participation of Miguel Angel Muñoz and Paula Martinez from the Telomeres and Telomerase Group led by Maria A. Blasco at the CNIO. In this study, CNIO researchers also collaborated with by Fàtima Bosch from the Gene Therapy Centre (CBATEG) at Barcelona's Autonomous University. CNIO's Telomeres and Telomerase Group has for years now been investigating the possibility of using the enzyme telomerase to treat pathological processes related with telomere shortening, as well as diseases associated with ageing – cardiovascular and neurodegenerative diseases, among others – and even the ageing process itself. In 2012, they designed a highly innovative strategy: a gene therapy that reactivates the telomerase gene using adeno-associated viruses (AAV). These gene therapy vectors do not integrate in the genome of the host cell, thus telomerase only performs its telomere-reparative actions during a few cell divisions before the vector is diluted out. In this manner, a potential risk associated with the activation of telomerase, such as promoting cancer, it is minimized. But to what extent? The potential medical use of telomerase still clashes with fears surrounding a possible increased risk of cancer. The paper being published now specifically tackles this question by applying gene therapy to an animal model, a mouse, which reproduces human lung cancer and which, therefore, already has a greater risk of developing this disease. The results are negative: "The activation of telomerase by means of [this gene therapy] does not increase the risk of developing cancer", not even in these mice, where tumours are forced to appear in a relatively short time, write the authors. "These findings suggests that gene therapy with telomerase appears to be safe, even in a pro-tumour context", noted Blasco. "In our research, we were already seeing that this gene therapy does not increase the risk of cancer, but we wanted to conduct what is known as a 'killer experiment', an experiment that creates the worst conditions for your hypothesis to hold true; if it survives even under those circumstances, the hypothesis is truly solid. That is why we chose these mice; they are animals that spontaneously develop a type of lung cancer that is very similar to the human form, which normally never appears in normal mice. We can't think of any other experiment that would provide a better demonstration of the safety of this therapy". Telomeres are at the ends of chromosomes, in the nucleus of every cell in the body; with each cell division, telomeres get a bit shorter, and when this shortening becomes excessive, the cell stops dividing and the tissue from which they are derived no longer regenerates. We know that telomere shortening plays a key role in ageing: both in animal models and in humans, it has been shown that the older the individual is, the shorter their telomeres. It has also been proven that mutations in genes related to telomeres give rise to a series of diseases called telomere syndromes, including aplastic anaemia and idiopathic pulmonary fibrosis. Telomerase is the enzyme that repairs the telomeres, and we all have the gene that produces it. In general, telomerase is only active during embryonic development (especially in the so-called pluripotent cells), but a few days after birth, its expression is silenced. In healthy adults, most cells do not contain telomerase: their telomeres cannot be repaired after each cell division, and that is why they are shorter than in younger individuals. One exception are cancer cells, in which telomerase is active, and that is in fact one of the reasons why these cells divide prolifically: their telomeres never shorten enough to halt division, and as a result, cancer cells are virtually immortal. Telomerase has always been seen as a double-edged sword: by repairing telomeres, we prevent one of the causes of ageing along with a series of diseases, but it could also favour the unchecked division of emerging tumours thus causing cancer. Researchers from CNIO have witnessed the power of telomerase in action: in 2001, they created the first transgenic mice that expressed adult telomerase, and they saw that with ageing, there could be a slight increase in the incidence of cancer. But in 2008, they proved that transgenic animals for telomerase also aged more slowly and lived up to 40% longer if, besides from expressing telomerase, they are also made more resistant to cancer. This strategy is not applicable to humans because it would entail modifying the genome from the embryonic stage. What is potentially applicable to humans is gene therapy, which activates telomerase where it is required, following a single local injection. Thus far, researchers have managed to demonstrate that this gene therapy with telomerase is proving to be effective in mice against infarction – contributing to the regeneration of heart tissue -, aplastic anaemia, and idiopathic pulmonary fibrosis. In all cases, gene therapy with telomerase has been seen to offer therapeutic effects. 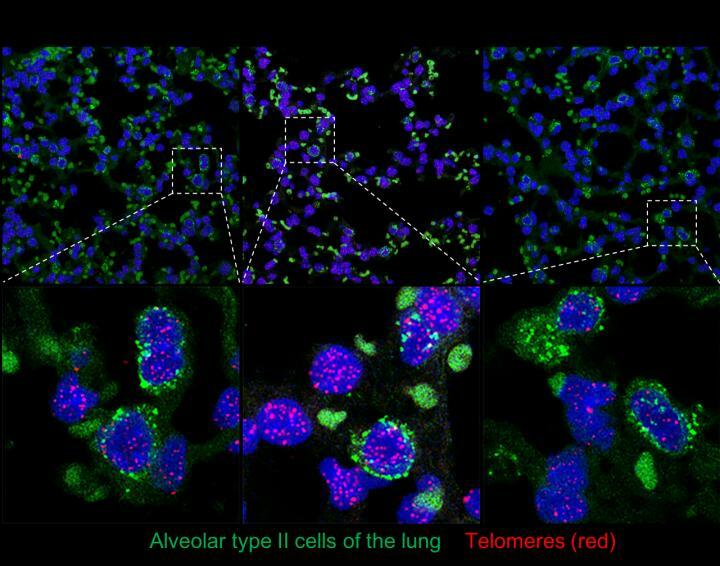 In particular, in the case of pulmonary fibrosis, which was perhaps one of the most spectacular results, telomerase was capable of halting the progression of this disease in animal models. Although none of the mice subjected to gene therapy developed more cancer, the CNIO group wished to conduct an experiment to dispel any doubts and make it patent that safe therapy based on telomerase is possible in order to speed up the clinical application of telomerase for the treatment of diseases that currently have no cure.